The Gerber CFB (Combat Fixed Blade) is an awesome lightweight Tactical/Utility Blade. 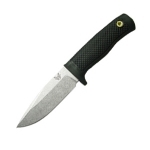 BLADE- the tanto design of the knife with the 154CM steel is perfect for stabbing and prying and the serrations make cutting of man made materials easy. The blade design falls short in slicing tasks and wood processing because of the tanto design. HANDLE- the kraton handle scales make the knife very comfortable in your hand and the thumb ramp and aggressive jimping give you great traction when stabbing with the knife. SHEATH- the injection molded plastic sheath holds the knife well and has a very slim profile and has many different carry options. CONCLUSION- the Gerber CFB is the perfect knife for military and law enforcement use. Lightweight, tough, and perfect for stabbing or cutting tough materials. This is not a camp/survival knife. It will not chop, baton, or cut wood well and is not designed for that.